Section - Main layout building block used to separate columns in to rows. Column - Main wrapper used to position elements within the row. Inner column - Same as column with the ability to be placed inside a column. Sections slider - This is a slider that can take any section with all it's elements and turn it in to a slide. Accordion - Display custom content within collapsible container. Button - A button generator shortcode. Calendar - Display your tasks or event as a monthly, weekly or daily calendar. Call to action - Display custom content intended to induce visitors attention. Circle progress - Draw an animated circular bar around the text. Code snippet - Display code blocks within styled code container. Contact form - Display a contact form for visitor that is automatically sent to your email when visitor submits it. Countdown - Display a countdown timer to any specific event. Counter - Display a animated numbers counter. Divider - Use divider to make a separation between page builder elements. Dot navigation - Create dots navigation that auto scrolls to an element when clicked on. Exit popup - Display a popup message when visitor tries to navigate away from your page. Icon - Select and display any icon from over 3500+ theme icons. Icon box - Display custom content with icon within styled content box. Items grid - Display a grid of customizable div content wrappers. List - Display a list of items within ordered, unordered or icon html list. Map - Display customizable Google Maps within a adjustable container. Menu anchor - Activate animate scroll to action to this element when a link is clicked. Notification - Display stylish customized message to your website vistiors. Parse shortcode - Parse any WordPress shortcode withing customizable container. 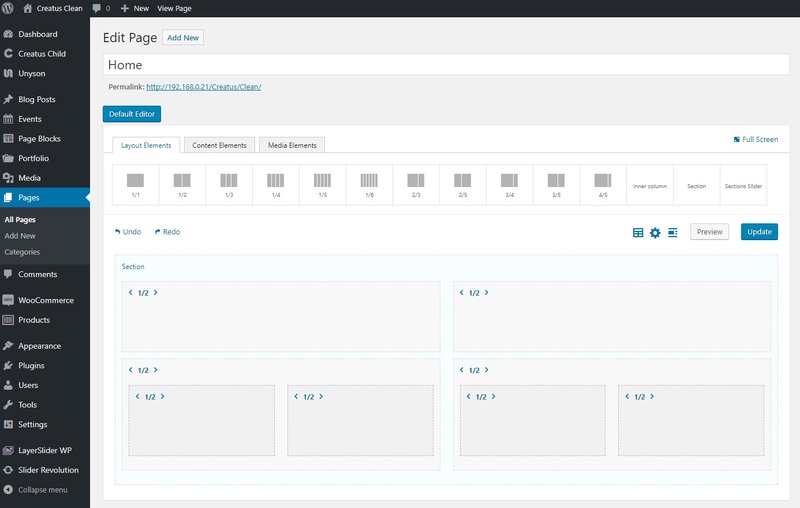 Parse page - Parse external or internal page content, cache it's contents and display it within customizable container. Posts - Display loop of post items as a grid, timeline or a slider. Progress bars - Display visualized progression of an text defined operation or task. Search form - Display live or static search form for your website visitors. Sections menu - Auto create dots sections menu that auto scrolls to a section when clicked on. Sharing links - Display a customizable container with social sharing links. Simple slider - Display a customizable content slider. 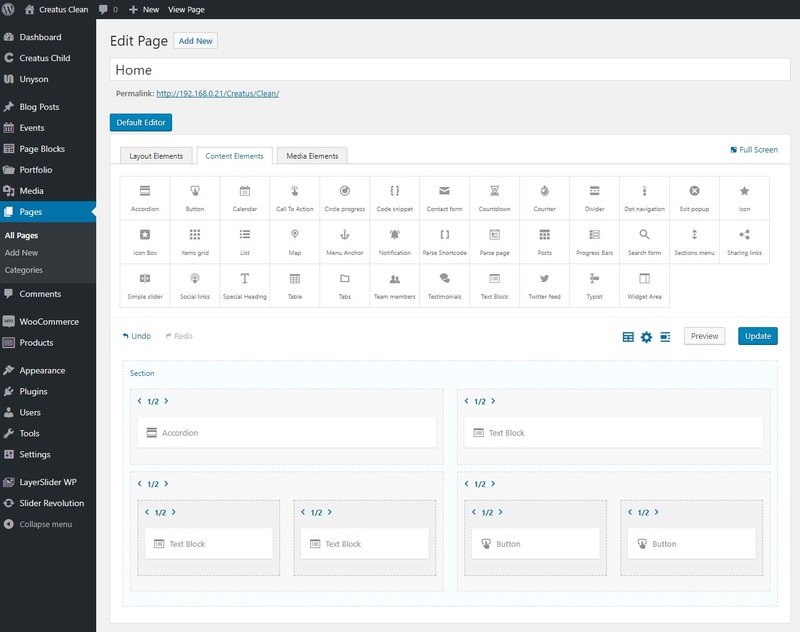 Social links - Display a customizable container with links to your social profiles. Special heading - Display custom styled heading with additional sub text block. Table - Display list of tabular data or a pricing table. Tabs - Display custom content within tab like containers. Team members - Display team members with their image, description and social profile links as a grid or slider layout. Testimonials - Display adjustable testimonials slider. Text block - Display text block within customizable container. Twitter feed - Display Twitter user feed as a grid or slider. Typist - Display typewriter text animation. Widget area - Display any WordPress widget area within customizable container. Before after - Highlight differences between two images. Image - Display an image within customizable container. Image hotspots - Create attractive image area hotspots with custom tooltips. LayerSlider - Display WordPress LayerSlider. Magnific popup - Display images, videos or iframe in attractive and customizable lightbox popup. Media - Display Vimeo video, Youtube video, Self hosted video or audio, HTML5 video or audio, iframe or embed within customizable container. Media gallery - Display Images, Vimeo video, Youtube video, Self hosted video or audio, HTML5 video or audio, iframe or embed within grid or slider. Slider Revolution - Display WordPress Slider Revolution slider. Slider - Display Unyson Slider extension sliders.